Lella Crowder, to me Zia Lella, was my mother’s younger sister who moved to the UK from Sicily at the age of 18. She married an Englishman, Uncle Alan, and they had two children, Paul and Francesca. Zia Lella passed away May 30th, 2014. All through my life she was a great presence and a source of love and joy. Over the last few years, it had become a tradition, as I traveled to Sicily from the USA, to stop in England and visit Zia Lella and her family. Having been diagnosed with Alzheimer’s fourteen years ago, over the years, Zia Lella’s quality of life had declined tremendously. However, when I visited her, it gave me great joy to be with her, hold her hand, and know in my heart that she knew I was a special person in her life. This year, I was planning to visit for a few days, in May, on my way to Sicily. However, Zia Lella’s condition worsened shortly before my arrival and upon arrival I knew I would not leave for a while. I had the privilege of being at her side, together with her children, Francesca and Paul, during her final weeks and the memory of those days will live with me forever. When I was born you enveloped me with your LOVE and that LOVE grew throughout our lives! However, I was not the only one touched by your Smile, Laughter and LOVE. Then one day, that awful disease crept up slowly taking you away, but inside of you YOUR spark endured and still escaped to greet those whom you loved when they came to you. Now, you have gone to the Home of the Father. May you dance again with Alan, Charlie and Ray; hold hands with Nuccio and Giovanna, embrace Gregorio, Tina, Mamma e Papa’. At last, for those of us who remain on this Earth, may the LOVE you spread nestle in our Hearts to comfort us until we meet again! 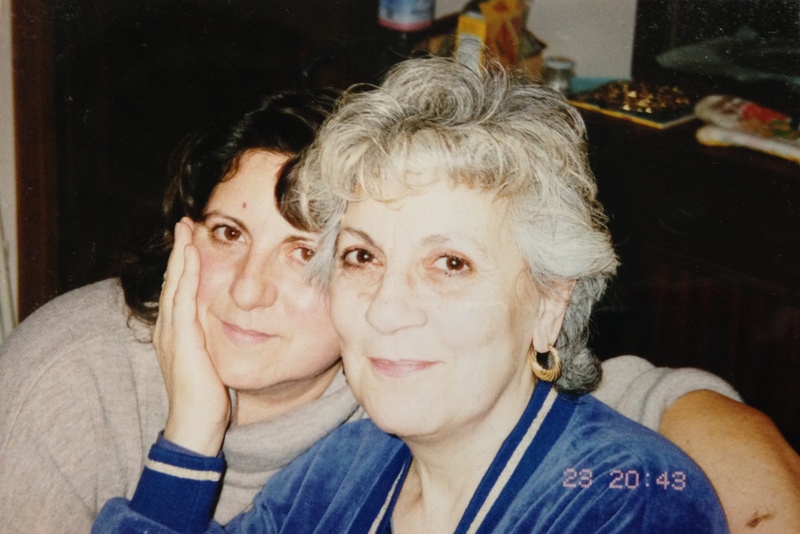 Zia Lella and I at my home in Germany years ago………. Rosanna, what a lovely tribute to your Auntie Lella. I am sure she is smiling down upon you with love and admiration! Sending you big hugs and lots of love! Thank You. I have been Thinking Of you.